The circular economy creates and captures new value for businesses, and adds extra dimensions to supply chains. This week, we begin with an overview of the circular economy, and some of the reasons it is gaining momentum as a critical tool for future-fit businesses: Nike, M&S, Renault and many others are developing circular products and services, and circular start-ups are thriving. Next week, in Part 2 of this article, we look at the implications for the supply chain, and how your business can get started. After a turbulent 2016, it feels like our world is changing ever faster: ‘mega trends’ include urbanisation, a redefined world order, rising inequality and political upheaval. Predictions include 3 billion new consumers set to enter the market by 2030 and the internet-connected population doubling to 5 billion in the next 5 years – fantastic business opportunities. Disruptors, like Airbnb, Spotify, Uber and others, scale up rapidly, displacing established brands and entire sectors. Amazon has even filed a patent for aerial warehouses. Most businesses operate on ‘throughput’ principles (see below: The value leakage in our linear economy): take some materials, make a product, sell it and work out how to sell the next one. But this approach shackles growth for many businesses as demand for resources, land and water outstrips supply. How can your business survive and thrive in these challenging conditions? Across the globe, in every sector, start-ups and big businesses are exploring the ‘systems thinking’ approaches of the circular economy. Some businesses are trying to disrupt from the inside: how would a new competitor design your business? How would a disruptor innovate products and services, decouple resources from profit, build brand loyalty and create resilient, adaptive organisations? Commercial photocopiers aren’t sold now; photocopying is a service with efficient repair networks plus refurbishment and remanufacture to enable second and third lives for each machine. Circular economy approaches regenerate ecosystems to better support human health and well-being. By converting the take-make-waste approach into value loops, creating more from less, the circular economy approaches decouple resource use from value creation. Marketing aims to create a dissatisfaction with what we have now, encouraging us to buy more stuff, or replace what we have with something better. We could describe our current economy as a waste system. It is woefully inefficient, using subtractive manufacturing processes: start with a lump of something and knock bits off to make the shape needed. At end-of-use, materials are sent for landfill, incineration or exported (often to where materials can be recovered without onerous safety regulations), allowing value to leak out of the system. A third of food is wasted between farm and fork; only around 14 per cent of plastic packaging is even collected for recycling; we create over 40 million tonnes of electronic waste globally every year. Harmful externalities from farming, extraction and manufacture - toxic waste, pollution of air, atmosphere, water and soil - are destroying the living systems we depend on – pressuring the earth systems and biodiversity services we depend on like never before. We make more stuff to replace these degraded natural systems, or suffer the consequences through disease, healthcare costs and productivity leakages. 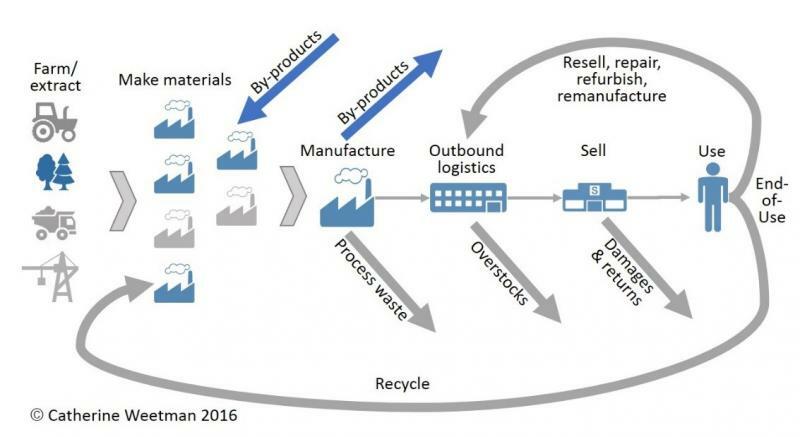 The circular economy is gaining momentum as a critical tool for future-fit businesses. Global businesses and new start-ups alike are developing circular products and services, helping their businesses become future-fit. In Part 1 of this article, we began with an overview of the circular economy, looking at some of the reasons why business leaders are adding it to their strategic toolbox. In this installment, we look in more detail at the implications for supply chains and how your business can get started. This breakdown over-simplifies the choices but starts to encourage a different mindset focusing on material choices and the ease of separation at end-of-use. Another lens to use is 100 per cent yield rather than zero waste. Here, businesses create new value from by-products and co-products and look for ways to recover and reuse energy and water inputs. Green chemistry and bio-refineries are finding new ways to extract valuable bio-chemicals from waste streams, providing inputs for pharmaceuticals, food and cosmetics before using the residual materials to create energy. When supply chains become multi-dimensional, they implement new flows and formats, service networks, more touch points, recovery loops for products and materials – they are ‘loopy’ instead of leaky. The diagram below shows some of the potential flows. Cycling materials and protecting their value (ready for resale, repair, remanufacturing or recycling) means re-thinking reverse supply chains and packaging design – not just Reverse Logistics 2.0. Procurement processes and contracts should focus on outcomes, enabling a win-win approach for suppliers and buyers. Can your business swap finite materials for recycled or renewable materials (and ensure biomaterials do not displace a food crop or contribute to deforestation)? Do you purchase something that is recyclable, but not recycled? Can you change that? New partners will emerge – perhaps supplying their by-products or high-quality recyclate to you as specialist repair and remanufacturing providers, or in eco-parks with symbiotic flows of materials, meaning waste from one company becomes a nutrient for a neighbour. Talk about circular approaches with your colleagues across the business – what’s already happening in your sector or in other supply chains? There are likely to be a few quick wins you can investigate, so you can begin the circular journey with little disruption and risk. Your business can also follow the steps below. Prioritise: are there some high-risk products or materials you buy, with volatile prices, toxic or scarce materials that you could replace with something safe and secure? Where are the biggest opportunities for value – could you recover your own resources, or create value from a new by-product? Could you design something to be more easily disassembled for repair or recycling? Could you swap from buying a product to contracting for service or performance, such as tyres by the mile? Work with suppliers to share your vision, scan for ideas and specify the goal (not the how-to). Help your suppliers innovate for a win-win outcome. Invest the learnings and benefits in the next projects – perhaps bigger scale or requiring more disruption to existing processes. Strategies and initiatives will evolve and improve, as your business builds on lessons learned. As an individual, you could choose simple examples to use yourself: a repairable Fairphone, 3D printed sunglasses, some recycled pens. You don’t need to create a completely closed loop product or service, or reinvent your entire supply chain - just start somewhere.